You can always find the latest installer (and its date and version) at the downloads page at the FR site. Notice in the image up above that on that update page, there is an indicator of "Release Notes". Definitely check those out each release to learn what is new. And note that that release notes document lists ALL the updates to FR since 5.0.0 (22 of them, including significant ones like 5.1 and 5.2, and then point releases within each of those, of which there were 9 in 5.0, 5 in 5.1, and now 6 in 5.2, so far.) I'll tell you, these guys are busy keeping it updated, adding features and fixes! One thing of particular importance for some readers, as they may upgrade to using Java 8, is that support in FR for that was added only in 5.2.0. If you've not yet upgraded to that release, it's an excellent reason to go ahead and update to 5.2.6. I understand that hesitation. Any of us who have updated our OS, or CF (or any app server), or Java may have experienced problems which were introduced in that "new update" (which was supposed to fix other problems, of course). I would just say this: the FR guys are highly focused on producing a quality product, including the updates. They put all updates through rigorous testing. Of course there can be a LOT of moving parts in any typical web app deployment, so they may not test some specific situation. I will add this: if you hit a problem and let them know about it (email support@fusion-reactor.com), they are generally VERY quick to attend to any problems, whether that means offering a private fix if appropriate, or later a public one. >Currently, besides watching that downloads page offered above, you can also access a link from within the FR interface to check on the latest available version. Use the "FusionReactor" button in the top left corner of your FR display (above the left menu options), and on that choose "About". On that page, you'll see text in gray at the bottom that shows your current version, and then above that is a link "check for FusionReactor updates", which will pass to the FR site your current version and license/maintenance info, and it will report if there's an update for you, and whether it's free. That page should then have links to the downloads, just like the download page whose link I offered above. You'll notice the downloads page offers both a full installer and just a jar. You can indeed run the full installer to do an in-place update of FR. Doing that will first update the FRAM instance (FR Administration Manager, the thing at port 8087 by default), and then it will lead you to run the update any instances in which you have installed FR. But in most situations you can also just drop the offered fusionreactor.jar in place over the current one (again, for FR5 installations. I'd not do that only for a move to FR 5 from FR 4 or earlier.) For more on using the jar file, such as where to put it (and also showing how you can use it to install FR into an instance even without initial use of the installer and/or FRAM), see this page in the online docs. Yes, you do. Whether you use the Installer, Instance Manager, or manual jar file update. That said, you don't HAVE to update your monitored app server. You can save that as a later step, as discussed in the next section. Yes, you can. When you run the updater/installer, it walks through the process of updating (and stopping and starting) the FRAM instance (which runs separately from your monitored CF/Railo/Lucee/Tomcat/etc instance). This one is indeed a surprise to many. FR is NOT just a monitor for CF (though it can indeed monitor any version of CF, from 6 or above). It can be used with not only ANY CFML engine (so CF, Railo, Lucee) but indeed ANY java application server, including Tomcat, JBoss, Glassfish, Jetty, and so on. (And because BlueDragon Server JX 7.1 runs atop Servlet Exec 6, which is a more modern Java server implementation, FR should run on that, though it's not listed as specifically supported on the FR site. More than that, now that FR (5 and above) is deployed as a javaagent, technically it can be used to monitor any java application at all. I suggested above that if you're on an FR version older than 5.0, you may not be able to simply run the installer in place. Especially for those running FR on CF, there is a technote with details of the steps you must take to uninstall form FR 4-related things (including FREM and any "wrapped" datasources) before proceeding to install FR 5+. 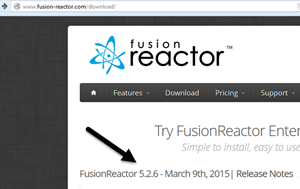 See Upgrading to FusionReactor 5 for ColdFusion Users. 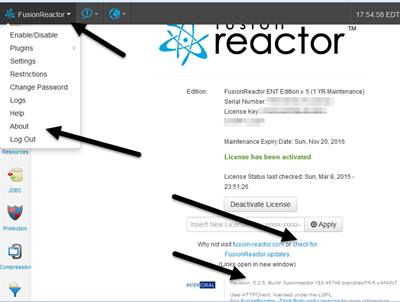 There is also more on Upgrading to FusionReactor v5 (from Sep 2013). Hope that's helpful to some readers. There may be some other questions folks may ask as comments here, or that I may think of later. I'll update the entry to reflect those as needed.